Did you know that many students can lose interest in learning by the end of elementary school?! To help foster a renewed interest in learning, the Milton Area School District and the Central PA Business & Education Association would like to give area students a greater awareness of the careers that may be available to them if they stay focused in school. 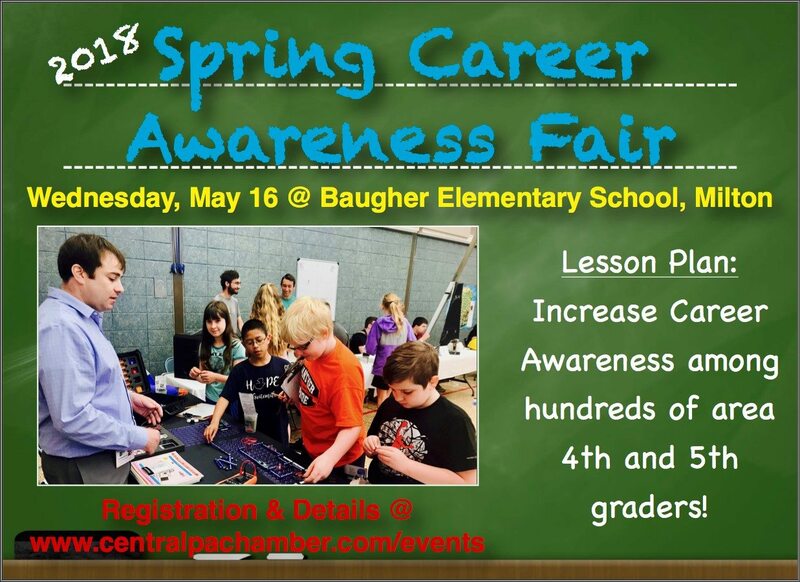 From 8:30 a.m. to 2:30 p.m. Wednesday, May 16, the 5th Annual Spring Career Awareness Fair will be held at the Baugher Elementary school in Milton. Please, consider participating in this effort to light a spark in area youth. It takes a healthy partnership between Business & Education to empower the workforce of the future. Lunch is provided. The goal is to have as many different occupations represented at the fair as possible, including post-secondary and military. Representatives from the various industries will be asked to briefly talk about their profession with the students as they progress through the fair. They should not go into a lot of detail about the demand, education and benefits, but focus on what they do and why they are passionate about their jobs. If there is more than one representative for a given career, you may be asked to focus on a specific aspect of your job so the students don’t hear the same story repeatedly. In addition to the fair, the goal is to provide a “Touch a Truck” component. In the parking lot, we would like to have several vehicles that would be used in occupations. It would be great to see farm tractors, fire trucks, well drillers, utility trucks, etc… This will certainly capture the attention of the young students. 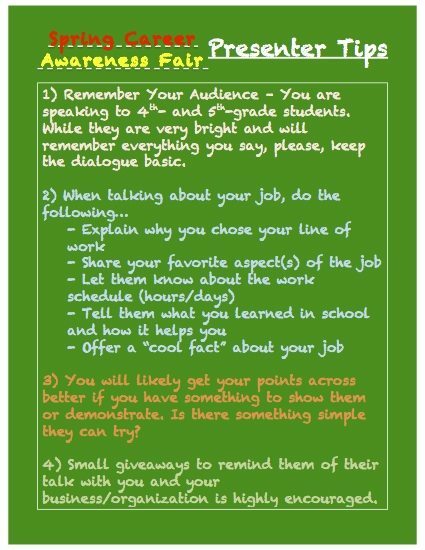 Listed below are “Presenter Tips”.